Dejehan Hamilton is the Executive Director and founder of Musica Palooza Camps. Dejehan is a percussionist and singer/songwriter of Trinidadian and Jamaican heritage, born in Hamilton, Ontario. Dejehan has been honing his craft over the past 13 years. During this time he has extensively performed internationally, and for music legends such as Harry Belafonte and Brian Mcknight. When Dejehan is not playing music, he is a motivational speaker who has a passion for investing positivity and hope into other youth. Dejehan holds a Bachelor of Music in Music Business/Management from the prestigious Berklee College of Music. Dejehan has been a pionneer for Canadian steel pan artistry by being the first Canadian on scholarship to attend Berklee for steelpan. was founded and designed by Dejehan Hamilton, a graduate of Berklee College of Music. The vision of the summer camp is to make music, creativity and the arts accessible to all children. Since the arts have been cut back in some school systems, Musica Palooza aims to be the supplemental aid during the summer and march break. Research has found that learning music facilitates learning other subjects and enhances skills that children inevitably use in other areas. “A music-rich experience for children of singing, listening and moving is really bringing a very serious benefit to children as they progress into more formal learning,” says Mary Luehrisen, executive director of the National Association of Music Merchants (NAMM) Foundation, a not-for-profit association that promotes the benefits of making music. During Musica palooza Summer Camp sessions, your child will be introduced to different genre's of music, music history, music theory, hands on instrument labs and music production along with camp games. 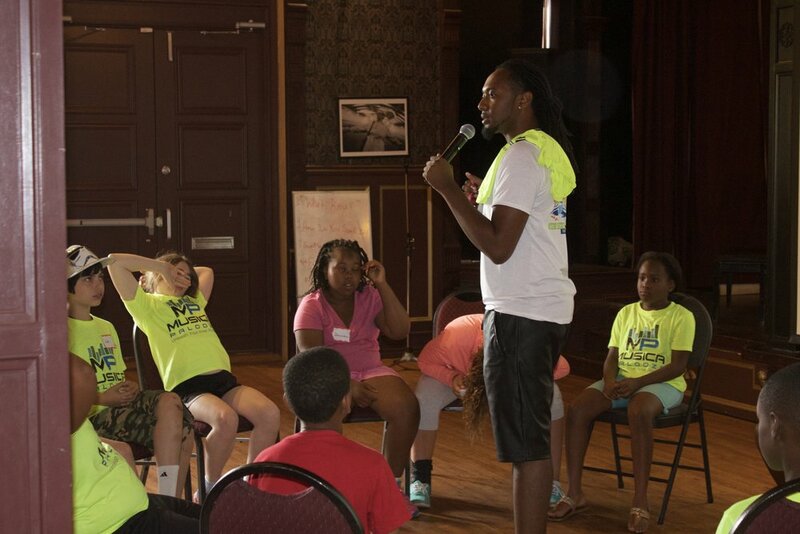 The campers will be instructed by musicians who attend some of the most prestigious Music schools in the world! The end product will be a public concert, where all is welcomed to come see the progress your rockstars have made during the camp sessions. Get ready to rock! The Executive Director and founder of Musica Palooza Camps. Dejehan is a percussionist and singer/songwriter of Trinidadian and Jamaican heritage, born in Hamilton, Ontario. Dejehan has been honing his craft over the past 13 years. During this time he has extensively performed internationally, and for music legends such as Harry Belafonte and Brian Mcknight. When Dejehan is not playing music, he is a motivational speaker who has a passion for investing positivity and hope into other youth. Dejehan holds a Bachelor of Music in Music Business/Management from the prestigous Berklee College of Music. Dejehan has been a pionneer for Canadian steel pan artistry by being the first Canadian on scholarship to attend Berklee for steelpan. A talented 20 year old Hamiltonian who studied in the Justice & wellness field. She recently graduated from the Protection, Security and Investigation program at Mohawk College. Kambreia is also a member and manager of the Mohawk women’s Varsity basketball team along with being a member of the Hamilton Youth Steel Orchestra (HYSO) for the past 11 years. Kambreia contributes more than 3,200 hours per year of immersion in the art of steelpan playing; peer mentoring and instructing younger, less experienced players, and performing at approximately 250 community events. In addition to the opportunities provided for creative exploration, she co-produced the 2013 Annual Christmas concert for an audience of approximately 200 supporters. This is Kambreia’s third year with the camp and she is looking forward to having a successful and fun experience this year. Kambreia plans to work in the security field and was a proud member of the 2015 Pan Am Games security team, with future aspirations to become a Police Officer. Born and raised in Hamilton, Ontario but recently moved to Toronto to pursue her dreams of becoming a Correctional Officer/ Youth Justice Officer. Shaunteé grew up in the church and has been singing since she was a little girl. Shantey loves the talent that God has placed on her life and is always willing to give back to others by participating in different activities where her voice can be heard. Shaunteé has all of the attributes to be a great role model for youth. She is a very kind, assertive and genuine person who works diligently well with others. Shanteé's main goal in life is to be the best she can be at everything she does. To help achieve this goal she always strives to put her best foot forward and not give up when situations gets tough. Shanteé is a very dedicated worker who will ensure the task given is done the right way and the outcome is phenomenal!